We need your help! Join us by imploring the National Park Service (NPS) to immediately stop killing native deer in Rock Creek Park (RCP). RCP is a national park -- all U.S. citizens have a voice in its proper management. Please sign this petition and circulate it to as many people as you can. In 1890, Congress established Rock Creek National Park in Washington, DC to be an oasis of peace from the wear and tear of urban life. Until this current killing policy started in 2013 the park provided sanctuary to native wildlife for nearly 125 years -- no one had been allowed to kill any native species in the Park. The RCP deer population had been stable for a decade without signs of overbrowsing damage or deer nutritional deficiency. Nevertheless in 2013 the Park Service began killing deer on an annual basis, claiming that the deer were interfering with forest regeneration in the park. However, recent information shows that the killing is clearly unjustified, inhumane, and ineffective. ● Independent Expert analysis shows that deer are not detrimental to the health of the park. Based on his extensive experience as a forest ecologist as well as review of the studies relied on by the NPS, Dr. Oswald Schmitz, of the School of Forestry and Environmental Studies at Yale University, concluded that "there is no evidence presented that deer are impairing the forest regeneration in Rock Creek Park." Dr. Schmitz concluded that the real problem was the non-native plant species that have invaded the park and have not been controlled, not the deer as NPS claimed. ● In the latest installment of the scientific study relied upon by the Park Service, the authors reported that deer are having no effect on native forest regeneration. The study compared plots from which deer were fenced out to similar unfenced plots. The authors concluded that "stocking rate ( a measure of the adequacy of tree seedlings to support forest regeneration) did not show any significant differences between fenced and unfenced plots." ● Federal Agencies hid the most recent data obtained for the NPS which supports Dr. Schmitz's conclusion. This result was recognized as so damaging to the NPS position that it was withheld from the public. Save the Rock Creek Park Deer had to file a lawsuit under the Freedom of Information Act to obtain the most recent data. 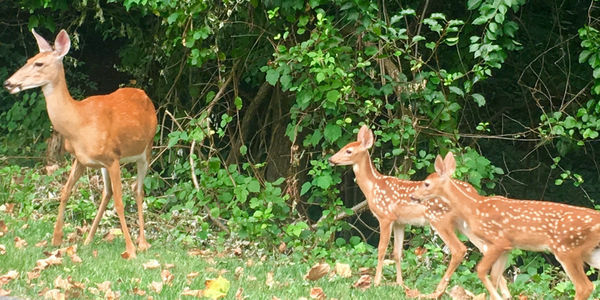 In September,2018, Save the Rock Creek Park Deer sent a letter to the NPS asking that it immediately halt its deer-killing program and correct its Impact Statement. The NPS has refused. We need to change that! Thank You for Your Concern and for Your Help! For more information, visit Save the Rock Creek Park Deer on Facebook. Photograph:"RCP deer mom and her twins"